photo owner: Golfclub Heidelberg-Lobenfeld e.V. Please note: all offers and availabilities are subject to change without notice; all prices include the current valid German VAT. Experience the historical Heidelberg from its most beautiful side. After a comfy champagne breakfast in our vaulted cellar you can start your day with the Cabriobus-Sightseeing-Tour through Heidelberg to get a first impression. Find out more about the interesting history of Heidelberg with a guided tour, walking around the Old Town and its narrow streets. Let the day end with a 3-course-dinner menu at the restaurant “Zum Güldenen Schaf”. Take the historical funicular up to the worlds famous Heidelberg castle ruins. Also visit the Schwetzinger Castle, the splendid baroque summer residence of the Palatine State, which is famous for its beautiful and harmonic castle gardens. From March until July you can enjoy the delicious Schwetzinger Asparagus fresh from the fields. Back in Heidelberg, you can arrange an individual program out of numerous guided tours, museums, and different cultural offers covered by the Heidelberg Card. During a 3-course dinner menu at the historical restaurant “Zum Güldenen Schaf”, you can review the beautiful impressions. Three nights in a double room. You save EUR 36,- per stay compared to the valid single prices! Bookable with the keyword “Romantic”. Two nights in a double room superior with additional sleeping couch for up to 2 adults and 2 children (up age 16, including). Very nice breakfast buffet in our historic vaulted cellar. HeidelbergBeWelcome Family Card with many attractions e. g.
Visit of the Heidelberg castle including a guided castle-tour. Visit of different museums of your own choice like e.g. German Apothecary Museum, Museum of Electoral Palatinate, Student Detention, ect. Free ride with the mountain railway to the castle and to Kings Chair. For the special price of EUR 255,00 per night for all 4 guests. You save EUR 56,- per stay compared to the valid single prices! Bookable with the keyword “Family Special”. Arrive, tee off, enjoy! 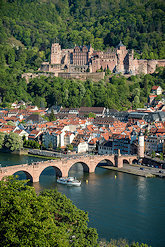 Use the golf package for a short break in the romantic city of Heidelberg. Our package offers you a trilogy of sport, culture and enjoyment. 1 x 18-hole golf course at the Golfclub Heidelberg-Lobenfeld e.V. Bookable with the keyword “golf”.